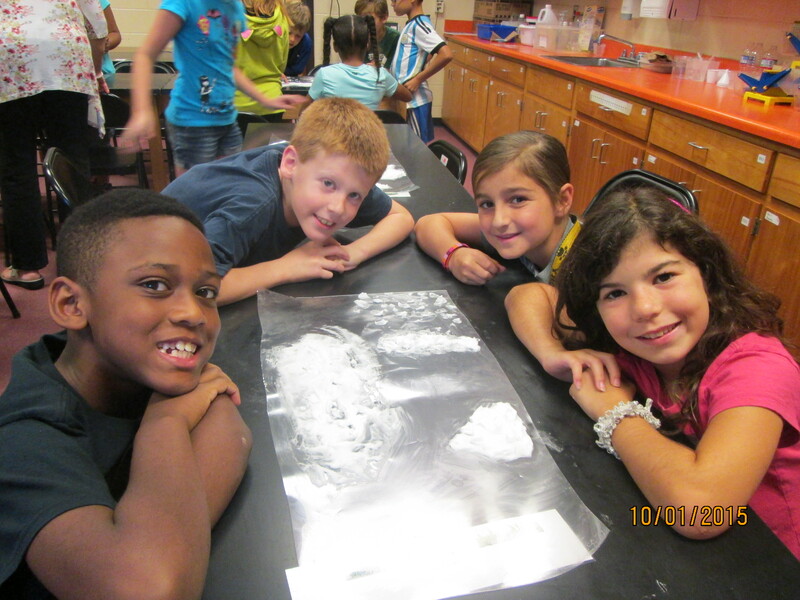 Kindergarten is studying Gravity during the month of October. We did experiments like the ones done by Galileo to see that objects of different weights fall at the same speed. 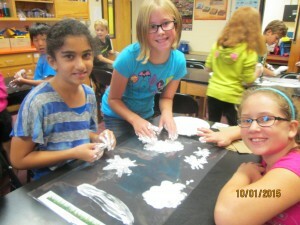 The Kincaid first graders will be finishing their units on Water and Weather during October. We learned how to use balance scales and did an experiment to see that ice weighs the same as the liquid created when the ice melts. 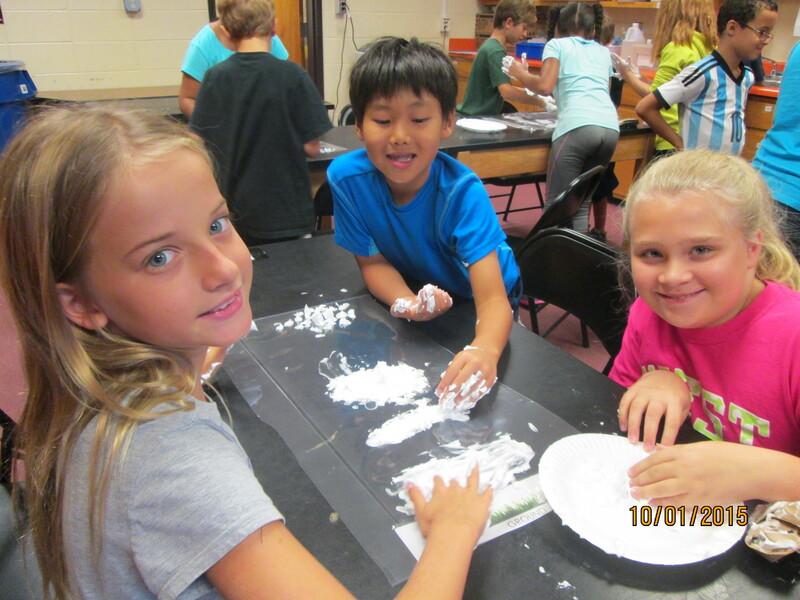 Second grade continued their unit on Matter. We investigated liquids and gases to learn the differences between them and solids. We even blew up a balloon without using our mouths! How to blow up a balloon without using your mouth: Pour about a cup of vinegar into an empty plastic water bottle. Put a large spoonful of baking soda into a balloon. Stretch the balloon over the opening of the water bottle (be careful not to lift it up and let the baking soda fall into the bottle). Lift the balloon up over the bottle and let the baking soda fall out of the balloon and into the bottle. Watch the balloon expand as a gas is produced from the reaction between the vinegar and the baking soda. Third grade will be finishing their unit on Fossils this month. 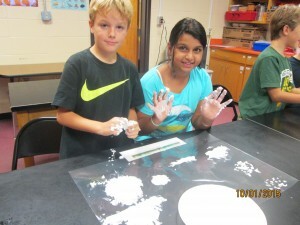 We have already created mold fossils using clay. Next each student will make a cast fossil out of plaster of paris. Ask your child what the difference is between a mold and a cast fossil. Fourth grade: We finished our units on Weather and the Water Cycle with a lesson on clouds. We had a great time getting our hands messy and making the different types of clouds with shaving cream. Then we made a “Cloud in a Bottle”. 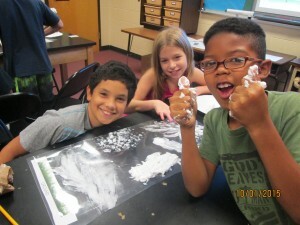 Check out the “Cloud in a Bottle” demonstration on the Steve Spangler website: https://www.youtube.com/watch?v=msSVQ903T8k. Next we will be learning about energy, pushes and pulls, and simple machines. 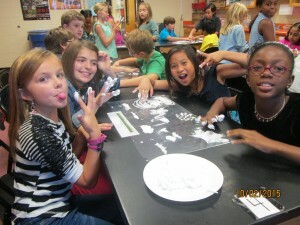 Fifth grade will be beginning their unit on Matter this month. We will be learning the difference between physical and chemical changes and performing some experiments so we can see some chemical changes. The fifth graders will also learn how to use a light microscope and use them to see how different substances that look alike when viewed with our eyes actually have different shapes when looked at under magnification.